From the title on this post, I'm sure you can already guess what I'm going to blog about this time. I just came back from Las Palmas de Gran Canaria 4 days ago (19 days ago now, that's how long I procrastinate for a single blogpost HAHAHA), a summer vacation with my mother-in-law, little brother-in-law and Hansel. And from my previous post, if you're wondering, my husband went to London the same week so he didn't come along with us (although he badly wish he could). Las Palmas, according to Wiki, is the ninth largest city in Spain, and enjoys the "best climate in the world". In my own opinion, it is kinda true because the sun is scorching hot (during the period we were there) but the winds were still cold. My body was confused haha. I wore sleeveless/short dresses on most days and I felt so cold whenever it's windy but my MIL & BIL felt that it was nice. Definitely because I have lived in a tropical country while they live in a cold country so I was more used to feeling warm. We arrived at the apartment in Sunsuites LUFESA in the heart of Puerto Rico at about 5pm on the 15th so we just went for dinner, recee the beach and we're done for the day as we were knackered due to the flight and long travelling hours. We woke up at 3.30am that morning too as we had to leave the house at 4.30am to head to the airport. On the morning of 16th, we planned to go to the swimming pool of the "hotel" first then to the beach but there was no sun where we were, yet, so we decided to head to the beach. I didn't have any sunscreen and only brought a baby moisturizing cream with me so I used it on Hansel and I. Boy, was it a bad idea not to have bought and applied sunscreen. We were at the beach for almost the entire afternoon and my MIL and I were badly sunburnt, already, on the first day. It started to hurt a lot the next day, or should I say almost the whole week we were there haha. PLEASE, PLEASE, PLEASE apply sunscreen when you know you are going to be exposed to the sun for a harmfully long period of time, it's really important and makes a BIG difference. On a brighter note, as at 16th of April, I am proud to say that Hansel is officially potty trained (at 19 months old), well poopoo wise but still a big milestone and I can save a lot of diapers as well! Gonna peepee-train him too. This comes to what happened at the beach. He was naked playing on the sand when he suddenly came to me and said "I want to poo poo" (instead of just doing right where he was since he was naked). I thought that he was just saying it on random but I still had to do something quick about it while asking him to wait so I took the diaper pants he wore before, ripped it apart and lay it down on the sand. I squatted him over the diaper and... he did it. Big business. Bravo Hansel! That's his first in doing a poo poo (almost) on the beach sand. Really proud mommy moment though, as he did not just poo right there and then he felt like. After the beach, we went to the pool by the apartment for the boys to play while my MIL and I hid our roasted skin under the parasols. The next day was city sightseeing day. My MIL decided no beach/pool day so as to allow our first degree burns to heal. I also got to reaffirm that Hansel is potty trained when that morning before we head out, he said he wants to poo and when I brought him to the toilet, he did it. That was how I know that he wasn't saying it for fun, and only when he feels the urge. Anyway, we got to town and hopped onto a 'Hop On, Hop Off City Tour bus'. That was Hansel's & my firsts right there again! It was really an experience and I would love to try Singapore's one day as my MIL has gone on it before and she said it was amazing. I can't imagine how it would not be. When we got there, my MIL got us a La Roche-Posay SPF50+ sunscreen and an Aloe-Vera aftersun gel. Phew! No more harmful UV on our skins. Took a bus back at 7.15pm and went for our dinner. End of day 2. Day 3 was lazy day too. Went to the pool in the morning, then to the beach and lastly to Angry Birds Activity Park, but only for a short while as there was a weekend crowd. On day 4, we went on a 2 and a half hour dolphin/whale boat trip! And although I was sick 3/4 of the time, it was worth it. The wild dolphins diving up and down the sea was such a beautiful sight. Just being in the vast, blue sea calms your heart and mind. And that also struck off another off my 'firsts' list. Oh yes, Hansel was asleep the whole journey, thankfully. Although I would wish for him to be able to see the dolphins with joy but I guess I won't be able to handle a sea-sick baby being sick myself. After which, we went for our late and very filling lunch before heading pack to the pool then home. The following day, we went to Cocodrilo Park. It's different as it was a rescue park. We saw animals that we don't usually see in the zoo. It also emits a heartwarming family feeling. There, I also had my firsts of feeding the monkeys, as did Hansel, petting a 2 month old baby fox (Hansel too) and attempting to carry it but didn't dare to in the end, and also holding a baby crocodile for a photo (I will upload once I manage to scan the photo). Awesome experience for both baby Hansel and I. Lunch after back in Puerto Rico, before I brought Hansel back to the apartment while my MIL brought my little BIL to the Angry Bird's as she promised to. I just felt it wasn't worth to pay for another adult, me, as children under 5 are free with a paying adult, because... there isn't really much for a 19 months old baby to play there. Plus, I was feeling quite worn out. On the last day, before the day of our flight back, we went to a place of highlight of our whole trip, Sioux City. It's a Wild West themed park and I felt like I was transported back into the past, even at the road to the park, before we entered. And the quiet day with no cars or people around the area augmented the wild west atmosphere. When we entered, it was all the more astounding. Just look at their daily shows! The Big Wild West Show is the biggest show of the attraction and it was really fun to watch. I actually recorded the whole show with my GoPro but it just doesn't look as good as watching it live, so I'm going to skip uploading it because it's like... 6GB in size (almost as big as a high quality 2-3 hours movie lol). 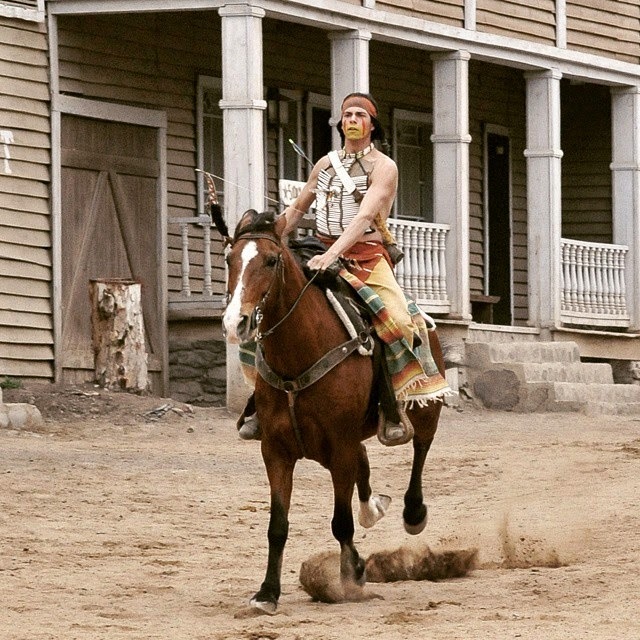 I absolutely loved it the most when the Red Indians made their appearances, it just looks so real, from their makeup to their costume to the way they ride and keep the horse in control! I'll see if I can cut that part out to upload. Meanwhile, you can take a look at the photos I've took. Sioux City is the place I took the most photos. Oh yes, the first Hansel and I have been to a legit Wild West themed park and also the first we rode a pony/horse. Did I also mention that they have used the themed park for several movies, one of them being a 'Clint Eastwood' film? I've stolen a picture of my favorite sheriff there (who happens to be the Red Indian too) haha. That marked the end of our trip to Gran Canaria, pretty much perfectly. It was a great trip with many 'first' experiences and I am grateful to be able to do all that. And also thankful to my MIL for bringing us there and paying for all Hansel's and my expenses, that we could have had the chance to experience all that we have. I was more glad that Hansel could get so much interaction with animals and experience a lot of fun.